A second year A level Art student has been chosen as the second prize winner for the Make Your Mark! – NADFAS Competition. NASFAS is the National Association of Decorative and Fine Arts Societies and they are an arts charity that works to advance decorative and fine arts education and appreciation. 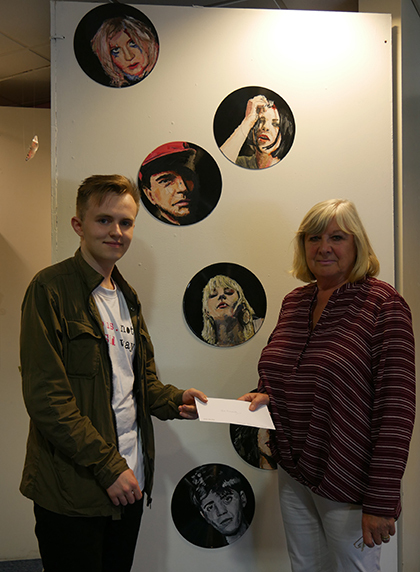 Student Jed Rimell (aged 18, from Hall Green) has been selected for his artwork of Indie music bands painted onto vinyl records and the prize raises the opportunity for his work to be chosen and exhibited for the Make Your Mark exhibition at the RBSA gallery in May 2017. This exhibition is a showcase for local, up-and-coming talent. The award results in a £50 cash prize each for Jed and the College, which was presented by NADFAS representative Anne Butcher. Jed has just completed his A level studies at the College in Art, Film Studies and Psychology and is awaiting his results in August. He has an unconditional offer to study Philosophy at the University of Birmingham in the autumn.